- Available in uniform sizes. - Safe to use & consume. Sesbania is used as a green manure crop throughout the world. We offer pure machine cleaned Sesbania Seeds round the year. We are engaged in offering a wide variety of Sesbania Seeds (Sesbnia Aculata) that is high on demand in the market. Our assortment of Sesbania Seeds is free from pesticides and other preservatives. Apart from this, the quality Sesbania Seeds that we offer are available at the leading market prices. We are offering Sesbania Seed. This seed is legume also known as a "Swamp Pea". It is great for duck marshes and quail. Sesbania makes a good cover for ducks and upland game birds, growing as high as 8-12 feet. It is one of the finest quality quail foods available. Dove and wild turkey also have a craving for Sesbania. Grows best in moist, heavy lands though will grow im most soils. Seeds are sown in polypots and watered regularly. Seedlings growth is very rapid. Seedlings are fit for planting within one month. We provide premium quality of Whole Spices and Powdered Spices. Even bird seeds are provided. We deal in sesbania seed having the quality of 5% reddish in colour and 2-3% in quality claim. 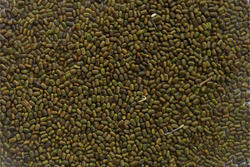 we are bulk supplier of cattle feed pupose forage crop seeds in tamilnadu.